Taking strict view of a series of non-compliances of various mandatory legal requirements, the Delhi High Court on Monday set aside the August 28 order of the Chief Metropolitan Magistrate (CMM) granting transit remand of Gautam Navlakha, one of five rights activists under house arrest in the Bhima Koregaon case, to the Maharashtra Police. A bench of Justices S Muralidhar and Vinod Goel set aside the CMM’s order granting Navlakha’s transit remand to the Maharashtra Police while also refusing to extend his house arrest as it noted that neither the CMM took into account material available with the police to necessitate Navlakha’s arrest nor was Navlakha informed about grounds of his arrest. These, the court said, were legal requirements which could not be diluted under any circumstance. “With there being several non-compliances of the mandatory requirement of Article 22(1), Article 22(2) of the Constitution and Section 167 read with Sections 57 and 41(1)(ba) of the CrPC, which are mandatory in nature, it is obvious to this Court that the order passed by the learned CMM on 28th August 2018 granting transit remand to the Petitioner is unsustainable in law. The said order is accordingly hereby set aside,” the bench ordered. “In view of Section 56 read with Section 57 CrPC, in the absence of the remand order of the learned CMM, the detention of the Petitioner, which has clearly exceeded 24 hours, is again untenable in law. Consequently, the house arrest of the Petitioner comes to an end as of now,” it ordered. The house arrest comes to an end two days after the Supreme Court by 2:1 majority disposed of the petition seeking court-monitored SIT probe into the case. Navlakha had moved court on August 28. He was arrested from his house at Nehru Enclave in Delhi. Before passing Monday’s order, the court noted that on August 28, when Navlakha’s petition had come before it, the Additional Solicitor General had informed it that necessary documents including FIR etc., were in Marathi language and their translation would take some more time. Despite being granted more time, the search and seizure form, the search panchnama, and the arrest memo, all of which were in Marathi, could not be translated by August 29. The bench noted that though originally the petition challenged the ground of arrests, it later challenged the remand order of the CMM. 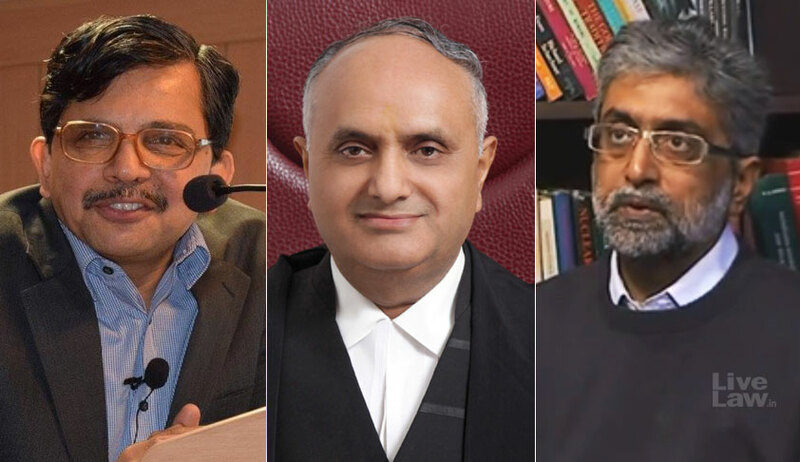 The bench dismissed Navare’s argument that once a person is in judicial custody pursuant to a remand order passed by a magistrate in connection with an offence under investigation, a writ of habeas corpus is not maintainable. Navare had cited apex court judgment in case titled State of Maharashtra v. Tasneem Rizwan Siddiquee. However, Navlakha’s counsel Nitya Ramakrishnan referred to the same case to say that the CMM had in the instant case not satisfied himself about the existence of material, and not the adequacy thereof, which could justify the prayer made in the remand application filed by the Maharashtra Police. “…Consequently, when the present habeas corpus petition was entertained and the above interim order was passed by this Court, there was no order of the learned CMM granting transit remand of the Petitioner. In each of the aforementioned decisions cited by Mr. Navlakha the entertaining of the habeas corpus petition by the High Court was subsequent to the transit remand order passed by the concerned Judicial Magistrate. This one factor distinguishes the present case from the above cases. Consequently, this Court rejects the preliminary objection raised by Mr. Navakre as to the maintainability of the present writ petition,” the bench said. From a combined reading of Article 22(2) of the Constitution and Sections 57 CrPC and 167 CrPC, the bench noted that “…even before a Magistrate before whom a transit remand application is filed, the mandatory requirement of Section 167(1) CrPC is that a copy of the entries in the case diary should also be produced. It is on that basis that under Section 167(2) such nearest Judicial Magistrate will pass an order authorising the detention of the person arrested for a term not exceeding 15 days in the whole. Where he has no jurisdiction to try the case and he finds further detention unnecessary, he may order the accused to be forwarded to the jurisdictional Magistrate. “Thus it is clear that even Magistrate before whom a transit application is filed is not required to merely satisfy himself that an offence has been committed and that the police officer seeking a remand is properly authorised. Such Magistrate is required to apply his mind to ensure that there exists material in the form of entries in the case diary that justifies the prayer for transit remand,” it said. The high court noted that another mandatory procedural requirement for the Magistrate considering a transit remand application as spelt out in Article 22(1) of the Constitution is that the arrestee is to be informed as soon as may be of the grounds of such arrest and the Magistrate has to ensure that the arrested person is not denied the right to consult, and to be defended by, a legal practitioner of his choice. The court dismissed Navare’s submission that given the seriousness of the offence and the urgency of the situation, it may not be possible for an investigating agency to comply with the above requirements in letter and spirit and that would always be an occasion for some or other requirement of the law to be bypassed. The answer is that in the present case such contention is hypothetical. “There may be a rare instance where such requirement cannot be fully complied with. But the concerned Magistrate will have to be satisfied with the explanation offered for the non-compliance and take a call whether it is serious enough to not immediately grant the transit remand. The departure from the mandatory requirement of the Constitution and the CrPC ought not to be lightly countenanced. In the present case for instance the FIR having been registered in January 2018, there was sufficient time available with the Maharashtra Police to anticipate the legal requirement and comply with it,” said the court. It then took note of the August 28 order of the CMM to find that a duty lawyer empanelled pursuant to the Scheme of the National Legal Services Authority was shown representing Navlakha. “However, the Magistrate does not appear to have asked the arrested person, as mandated by Article 22(1) of the Constitution whether he was informed about the grounds of arrest and whether he wishes to consult and be defended by a legal practitioner of his choice. This requirement does not get diluted one bit only because the proceedings are for transit remand,” the bench said. “The order passed by the learned CMM on 28th August 2018 further reveals that the CMM perused the handwritten application prepared by the IO i.e., Assistant Sub Police Sushil B. Bobde and satisfied himself of the identity of the said police officer. The CMM then noticed the submissions of the IO that the Petitioner had been arrested from his house at Kalkaji, Delhi and that he had been arrested without any warrant and that “He is required to be produced before the Court of competent jurisdiction i.e., the Court of learned Special Court, Shivaji Nagar, Pune, Maharashtra and, therefore, his transit remand be granted”. “The learned CMM then observed that he has given his “thoughtful consideration” to those submissions of the IO and the learned APP for the State. There is no mention of the legal aid lawyer having been made any submission whatsoever. The learned CMM did not even think it necessary to record any such submission. It thus appears to the Court that the appearance of the Duty lawyer for the Petitioner was cosmetic and not in the true spirit of Article 22 (1) of the Constitution read with Section 12 (g) of the LSA which guarantees free legal aid to every person in custody,” it said. The high court noted that even after the transit remand was granted, the relevant documents were not translated from Marathi and therefore, the court never satisfied itself about the material available to necessitate arrest. The high court went on to add that the CMM in his August 28 order noted that as per the police papers and the FIR registered and that as per the arrest memo, the Petitioner was arrested at 2.15 pm on 28th August 2018 and that “intimation of arrest of accused has been given to his partner”. Here again, the learned CMM has overlooked that under Article 22 (1) of the Constitution, the arrested person has to be informed of the grounds of such arrest. Mere intimation of arrest to the partner/ friend of the arrested person does not satisfy the requirement of law. “It will be recalled that when this case was heard on 29th August 2018, it was unable to be disputed by the learned ASG appearing for the State of Maharashtra that the case diary was not asked for by the learned CMM although it as available. It was also not disputed that the case diary was written in Marathi language. It will also be recalled that when this Court on 28th August 2018 asked the State of Maharashtra about the relevant documents, time was sought to prepare the translated copies of those documents, which were in Marathi, but the complete translation was not ready even on the following date of hearing, i.e., 29th August, 2018. “Therefore, in all probability, when the IO appeared before the learned CMM with the case diary, since the case diary was written in Marathi and since the translated version thereof was not available at that stage, even if the CMM had asked to see it, the CMM could not have been able to comprehend as to what was written in the case diary. It is nobody’s case that the learned CMM was conversant in Marathi language. Consequently, the learned CMM would not have been able to appreciate whether the requirement of Section 41(1)(ba) of the CrPC stood satisfied,” said the high court.